The Eastern Idaho Photographic Society (EIPS) of Idaho Falls, Idaho, is a photography club for amateur and professional photographers. Now is an excellent time to join us as we envision a new future for our club. 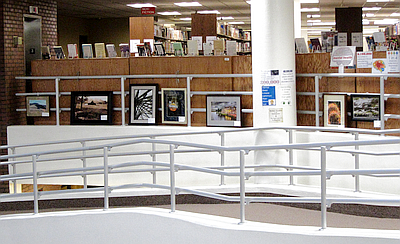 Displaying our photographic art in public venues. We want to pursue these activities in a more flexible and open framework, driven by the particular interests of the members. For example, we have sponsored a juried show with framed photos in October of each year in the past. We may decide to let that go. Conversely, we have had only local excursions in recent years (to sites we can visit in the course of an evening meeting); no field trips on weekends to more distant sites. We are open to changing these activities as desired by our members. Our meetings occur on the first and third Monday at 7:00 p.m. There may be a few cases when the weather is nice and we meet to take pictures at some photogenic spot, but generally we meet at The Bridge Club, 1421 Benton St. in Idaho Falls. Benton Street is just one block long, west of St. Clair and a half-block north of 9th St. The Bridge Club building is a blond brick building sitting back from the street on the north side, a half-block west of St. Clair. See the middle pin on the Bridge Club Map for more directions. Usually we do friendly critiques on the first Monday and have talks and workshops on the second Monday. The second Monday is also a time when we may meet for a photo shoot at a nearby location. In those cases, we may meet before 7 pm, at the location. Anyone who can't arrive on time can text or call us at 208-709-8580 to find out exactly where we are. See the Calendar for specific activities on particular meeting dates. The other way to know exactly what is planned for particular meetings is to be on our e-mail list. Send an e-mail to the Club President requesting to be added to the list. The club president sends out a note a few days before each meeting. The EIPS will be exhibiting pictures in the Studio Gallery at the Art Museum (TAM) of Eastern Idaho from May 21 to July 6, 2019. For details including the number of pictures that can be submitted and dates to supply titles and to bring the framed photographs to the museum, see TAM Exhibit 2019. We expect to continue doing most of the activities described below. We are reevaluating the schedule and how often we perform them. The first monthly meeting focused on photo critiques. We entertained each other with our photos by bringing them for review by the group. We projected the photos and briefly discussed them. The critiques are positive and designed to improve our skills as photographers. The second meeting of the month was either an educational presentation, workshop, or excursion to a nearby site for taking pictures. We entertained each other with our practice of photography. It is always good to bring your camera and tripod to these meetings. The educational presentations often introduce us to new ways to enhance our photographs using computer software. EIPS members also enjoy taking still-life pictures and experimenting with light. Many of the workshops involved staging objects and taking pictures at the meeting site. For the excursions, we sometimes met at the site; but other times we met locally and went in carpools to the selected site. Being on our email list keeps us informed about the excursion specifics. The choice of activity often depends on the weather! Exhibiting our pictures is another major activity of the EIPS. We have participated in the summertime monthly Gallery Walk sponsored by the Idaho Falls Art Council. We have displayed our photos at other public sites such as the College of Eastern Idaho. We have conducted annual expositions or shows in the fall. The shows have been judged by professional photographers. The club also hosts field trips from time to time, on weekends or other times when members are able to gather and travel a bit further for picture-taking. We are privileged to live an a place where the beauty of the natural world in many different forms is nearby. The national lands around Idaho Falls such as Yellowstone Park provide excellent opportunities for us to photograph landscapes and wildlife. The December 2010 issue of Outdoor Photographer selected a list of the top 25 places in the world to photograph landscapes, and 5 of them were less than 10 hours away from Idaho Falls. The closest was only 149 miles (3 hours) away. Another example of our excellent location for photography is the fact that 3 of the 100 landscapes around the world that were shown in the June 2010 issue of Outdoor Photographers contest were within 200 miles of Idaho Falls. Members also enjoy taking pictures of nearby events such as the annual dog sled race in the winter and the Shoshone-Bannock festival at Fort Hall in the summer.